1. 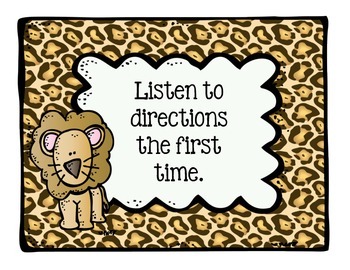 Listen to directions the first time. 2. Respect yourself, your peers and your teachers. 3. 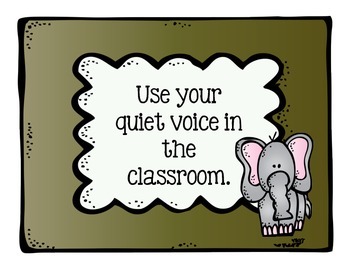 Use your quiet voice in the classroom. 4. Do not run inside the classroom. 5. Raise your hand to speak. 7. Keep ALL your body parts to yourself. These posters are for use in any room with a jungle, zoo, or animal print theme! Keep your students on track with these vibrant visual remembers. Please be sure to leave feedback and check out my other products!